It need not take a big budget to make a big impact. This was something that students of INTI International University (INTI IU)’s Mass Communication Club learned by organizing the thought-provoking ‘Before I Die’ project on campus. 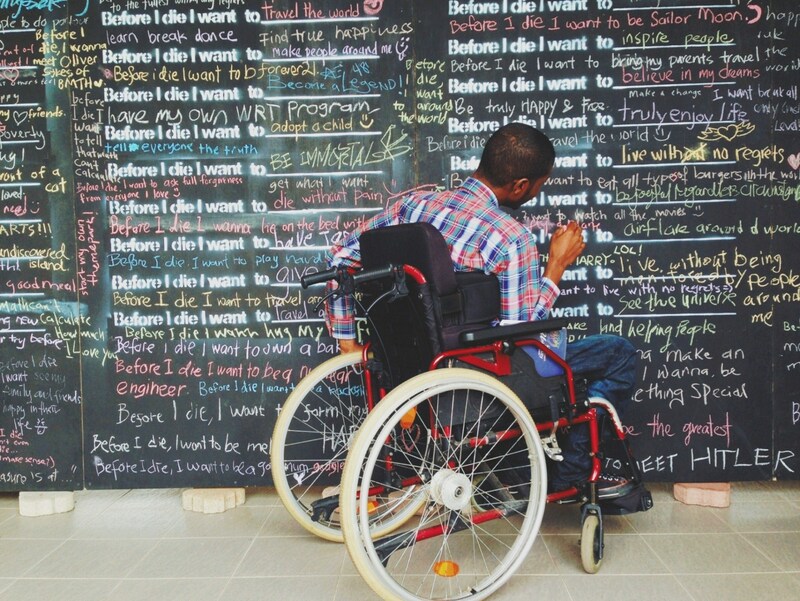 With simple tools like chalkboard paint and stencils, they created public space for people to reflect on their lives and share their personal aspirations. 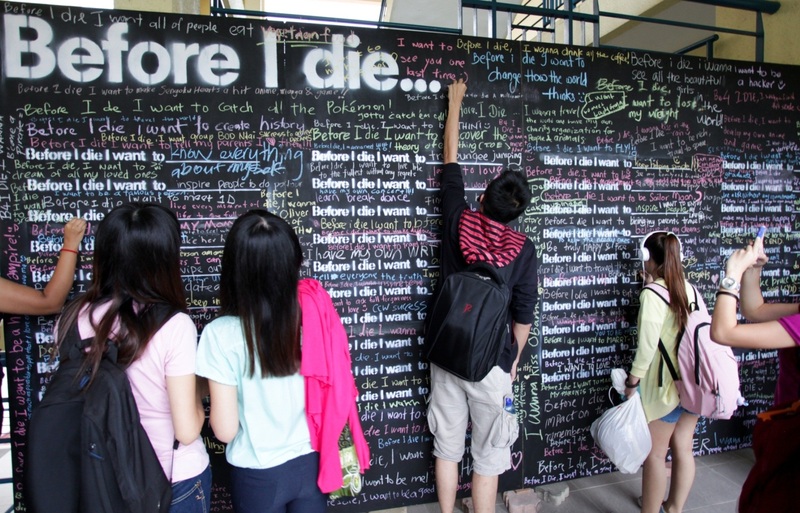 Students filling every nook and cranny of the ‘Before I Die’ boards at INTI IU. Inspired by artist Candy Chang from New Orleans, the project has garnered handwritten responses in more than 24 languages from over 55 countries across the world. Over 350 ‘Before I Die’ walls have now been created worldwide, with each reflecting the people of the respective communities. At INTI IU, more than 400 responses have appeared on the boards put up by the organisers. “The project involved stenciling a board with a grid of the sentence ‘Before I die I want to _______’ and allowing anyone going by to complete the sentence with a piece of chalk. It is an innovative means of communication between members of the INTI community as they reflect on their lives, and share their personal aspirations such as spending more time with loved ones, being confident and determined, having faith in pursuing their dreams, and more,” said Eva Khoo, Chairperson of the Mass Communication Club at INTI IU. “Innovative learning is central to the educational experience at INTI IU. The ‘Before I Die’ project generated a lot of interest among students and created awareness on the importance of setting at least one objective for themselves,” said Roberto Calleja, Head of Mass Communication Programme. “Aside from student-organised projects, multiple industry projects are also introduced to enable students to work with employers on real business issues and solutions to gain experience and readiness for the workplace. Our students have undertaken over 160 innovative projects from 2012 up to June 2013 in collaboration with industry partners. Real employer projects have been brought into the classroom to help students develop problem solving, collaboration, communication and critical thinking skills,” he added. To bring out a student’s full potential, individual development is also emphasized at INTI and this involves the student’s journey of transformation to become a competent graduate via a self-discovery and development plan using personality assessment tools, industry talks, and career camps. Students build self-confidence and communication skills via specially-developed General Education modules. Individual development also involves coaching and mentorship programmes, grooming workshops, and on campus recruitment which has seen over 180 students offered jobs by top employers over the past year. For more information on INTI’s student-centred projects, please call 06-7982000 / 03-5623 2800 / 03-2052 2888 / 04-631 0138.